Be a Yoga Tourist. During your travels, you may want to seek out a little zen time and explore what types of yoga classes the area has to offer. 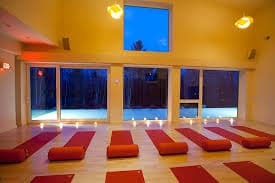 Whether you are experienced or a newbie to yoga, it’s fun to take a class in a new style or one not available at home. When you plan your next getaway, ask about local yoga classes. Chances are, there’s a yoga studio nearby and local yogis looking forward to welcoming you. You may even want to consider treating yourself to a private session. 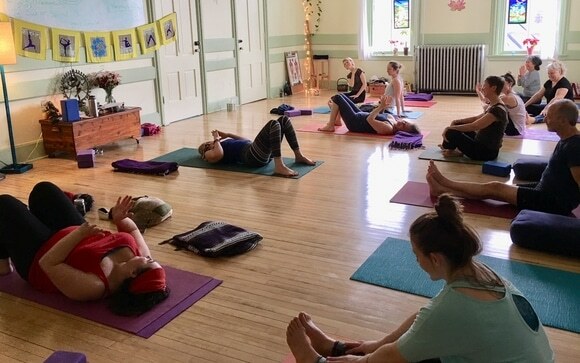 While staying at Rabbit Hill Inn, you can do yoga like a local at one of these six cool yoga studios. Most of them are just 10 minutes from the Inn. This entry was posted in General, Things To Do, Uncategorized and tagged Balance Bethlehem yoga studio, Heart Space Yoga Studio St. Johnsbury Vermont, hotels near Bethlehem Balance yoga studio, places to stay near Balance Bethlehem studio, Root to Bloom Yoga Studio Littleton New Hampshire, Taking yoga classes on vacation, Tiger Yoga Studio St. Johnsbury Vermont, where to take yoga classes in Littleton New Hampshire, where to take yoga classes in St. Johnsbury Vermont, where to take yoga classes near Rabbit Hill Inn, yoga classes near Rabbit Hill Inn, Yoga classes on vacation, yoga like a local, Yoga studios in Bethlehem New Hampshire, yoga studios in Littleton New Hampshire, yoga studios in Northeast Kingdom Vermont, yoga studios in Northern Vermont, Yoga studios in St. Johnsbury, yoga studios near Rabbit Hill Inn, yoga tourism, yoga when you travel by leslie. Bookmark the permalink.